When I first got the Pebble smart watch last year, the battery would last around 5-7 days depending on use. At first there was no easy way to tell how much battery life there was but over time they loosened up the restrictions and various watch faces made use of the battery indicator. The battery life after a year of use is now around 3-5 days but since I do not sleep with a watch on, it is very easy to plug in at night if I need to. The Gear Live however has needed to be charged every night so far if I wanted to make sure it would last the whole day the day after. The reason for the difference has to relate to the screens, next section, but as I said before, since I do not sleep with a watch on it is very easy to charge each night. The Pebble uses a type of e-ink screen similar to a Kindle but the Gear Live has a full AMOLED screen. The Gear Live has a touch screen while the Pebble does not, instead relying for input on the 4 buttons on the sides. The Gear Live screen is harder to see when outside on a sunny day but it looks great when you are away from the sun. The fact that the Gear Live has a bring touch screen is the reason for the battery use as it takes a lot more energy to run that screen when compared to the Pebble screen. I have tried out an app on the Gear Live that allows me to view my camera on my phone and I was pleasantly surprised by how it looked. You are able to turn off the “Always on” setting on the Gear Live so the battery lasts longer and all you need to do is raise your wrist or tap the screen to turn it on. The e-ink display has some benefits but I can see a lot more potential for the AMOLED screen on the Gear Live. The Pebble had its own software that worked well with notifications from your phone or tablet but the Gear Live uses the new Android Wear operating system that works with the Android operating system. While I have enjoyed the amount of apps that made use of the Pebble system, such as the golf GPS apps or the running/biking apps, I am very happy to see how many apps are already making use of the Android Wear system. While the main purpose of the operating system for both is to get your notifications quickly from your device, you are able to do more with the Android Wear operating system thanks to the touch screen and the features built into Android Wear. Again it is early so there are still some major apps that do not have more features for the Android Wear operating system but I fully expect to see them down the road. Android Wear also allows for voice input to conduct various tasks. By saying “OK Google” you can then follow up with commands that can start an email or chat or even set an alarm. I can start playing music or open an app for biking with just a few words. This is a little awkward at first but it can be something that becomes easier to do over time. This voice input though does give you a lot more options when compared to the inputs on the Pebble watch. The Gear Live also includes a heart rate monitor and has a step counter that works in the background, both are missing from the Pebble watch. The Gear Live does have one button on the side, something the other Android Wear watch out right now is missing, but most of the input is through the touch screen. I found the Gear Live getting more random inputs by brushing against something or when my son reaches for it, something that didn’t happen with the Pebble but that was the difference between a touch screen and not. 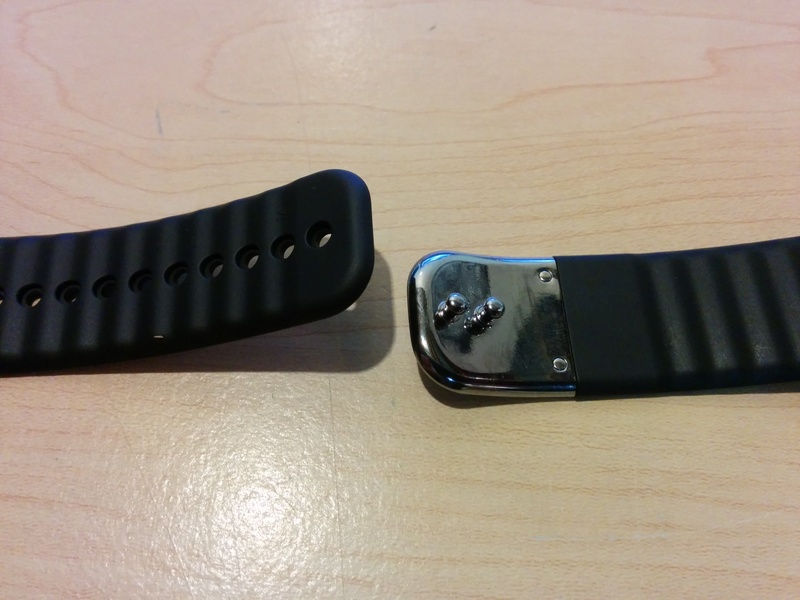 The vibration feature of the Pebble was more noticeable than the Gear Live but this may be something they can change later by making it vibrate for longer. The rest of the features are not too big of a deal, except for the watch band. I am not liking the watch band for the Gear Live as it has a different clasp than I am used to and I am afraid of it falling off so I switched it for the Pebble band as I keep looking for a better one. I loved my Pebble smart watch but I am also loving my Gear Live so far and I see more potential with the Gear Live due to the touch screen inputs and the color AMOLED screen. I will not be getting rid of my Pebble as it is definitely a better device if I need something that lasts more than a day and can handle more immersion in water. I can see wearing my Pebble when swimming in a pool or some other time that I will go beyond the 1m of water depth allowed with the Gear Live. I also see the Pebble as being a little stronger since it does not have a touch screen when I want to wear it while doing yard work or anything else when I am afraid of something smacking into it. 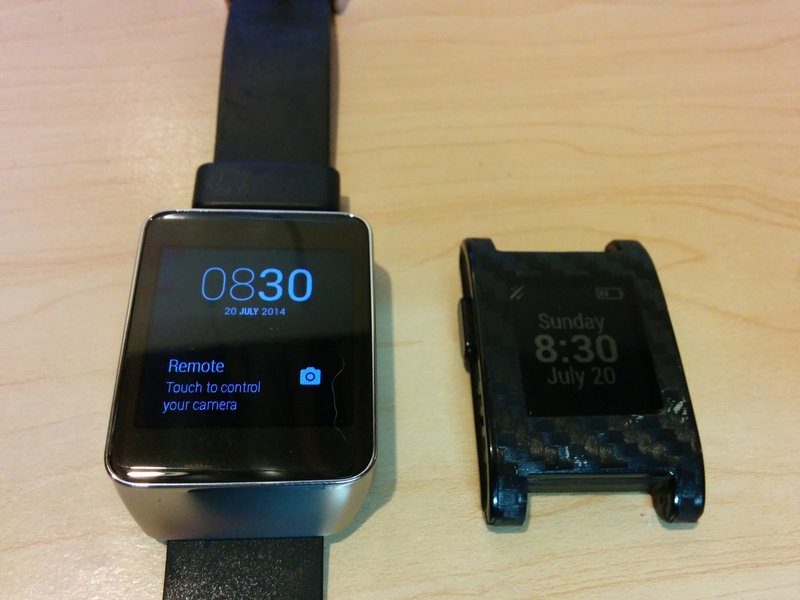 The prince points were not too far apart, $150 for the Pebble and $199 for the Gear Live, and both were birthday presents, just a year apart. As with any piece of tech, you have to pick the device that has the features that best fit the need you have at that time. As a teacher, having a smart watch is a way you can be more connected than before. Getting notifications from email or other apps allows you to easily see when people have questions or if something needs your attention. I always tried to avoid pulling out my phone in the classroom but when I became a father, that phone was a connection to my son through whoever was taking care of him at that time. If daycare called and he was sick, I only had an hour to get him so I need to know that right away. Just looking at my watch instead of pulling out my phone makes things a lot more efficient and less intrusive. Over the last year I was able to see emails as they came in and was able to see if someone needed to see me so that I could head straight there instead of needing to open the email on my phone or computer. I was able to get notifications from Twitter or my website rapidly which meant I was better able to respond. I enjoyed being connected and this allowed me to react more quickly to issues or know right away if I needed to respond to that email or not. Again, I see a lot of potential and as wearables become more and more common in the classroom, they can become a useful tool as long as you know how to make it useful. We should not fear them when students bring them in but we should be aware of what they can and can not do. While it is possible for a student to send a message to another student and have that pop up on their watch, that is not going to be the main purpose or the common purpose of that device. While this could be used for cheating, I think that becomes something we can easily address and even deter with better assessments. I think most of the cheating that people fear with the increased use of technology can be removed by developing better assessments that better measure learning as opposed to all multiple choice assessments which can be cheated on more easily. July 20, 2014 in Tech Tips.